Community Radiology Associates | White Oak Imaging Center at corner is part of a network of outpatient radiology centers located throughout Carroll, Frederick, Montgomery and Prince George’s counties in Maryland. Our White Oak center is a full-service imaging center offering everything from MRI/MRA, CT/CTA, ultrasound, 3D mammography, DEXA for bone density measurement, fluoroscopy and X-Ray. Community Radiology Associates | White Oak Imaging Center is proud to offer the latest tool in breast cancer screening – 3D mammography. Studies show that 3D mammography detects 40% invasive cancers than traditional mammography alone. 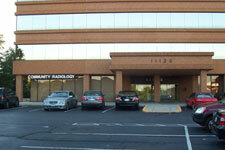 So when it’s time for your annual mammogram, trust our womens imaging experts at White Oak. Our White Oak Imaging Center serves the communities of White Oak, Silver Spring, Kemp Mill, Hillendale, Bethesda, Forest Glen, Takoma Park, Chevy Chase, Garrett Park, Colesville, Fairland and more. Conveniently located not far from New Hampshire Ave (MD 650), Stewart Lane and Columbia Pike (US-29), our White Oak location provides easy access to medical imaging services for the residents in and around Silver Spring. The center is located just 3.5 miles from Washington Adventist Hospital in Takoma Park, making it the perfect location to have all of your radiology exams performed, whether it’s an MRI or your annual mammogram. You can count on Community Radiology Associates | White Oak Imaging Center to provide timely, transparent, and accurate information about all aspects of your radiology exam. Call us today to find out more about the services we offer and the convenient appointment times we have available.